Urban planning and development ideas circulate through regional, national, and international networks of experts, policymakers, and investors. But the same idea, plucked from abroad and cultivated by local hands in local soil, bears strange fruit. Los Angeles’ biggest walking and biking event, CicLAvia, started from a Colombian idea that circulated through a New York-based urbanist network, yet its success and its challenge are wholly Angeleno. The model closes streets to vehicular traffic for several hours on Sundays in order to provide a welcoming street space for biking and walking. It creates a linear park space of varying lengths, usually between seven and ten miles, that tens of thousands of people pass through during each event. As an early organizer of CicLAvia, I see it as a site for observing the multiple urbanisms that define Los Angeles’ public spaces and the shifting economic values attached to them. Making streets feel more welcoming has economic effects, in a property system like ours, and cultural celebrations can become mechanisms transforming community assets into private profit, but shining a light on LA’s diverse urban worlds projects a postcolonial message, if you know where to look. However, something embedded in the event has thus far gone unrecognized: CicLAvia’s break with mainstream bicycle planning. The ciclovía made it to LA through international sustainable transportation knowledge networks, but it works in LA because of the shared public culture across a Latin American metropolis and a Latin@ one. In many ways, Los Angeles is a Latin American city, from its mestizo origins as a Spanish and then Mexican town, to the ongoing waves of migration that have brought inhabitants from Mexico and Central America and kept español audible. Dominant trends in bike planning tend to originate in Northern European countries; was it not more fitting to bring something Latin American to the streets of El Pueblo de Nuestra Señora la Reina de los Ángeles del Río de Porciúncula? An event rooted in a vernacular urbanism opens the door to recognizing that different worlds inhabit shared public spaces. It’s postcolonial by design. When I spoke with Colombian PRO-CICLA organizer Jaime Ortíz Mariño in 2008, he agreed, emphasizing the disruption in flow represented by a transportation idea from South America taking hold in the United States. Colombia had borrowed U.S. highway designs, approximating modernity through automobile infrastructure, but now the U.S. was looking to Colombia for less destructive alternatives. Jaime sketched me a map of the world that showed what he called the “global center” (as opposed to “global south”) as the “unión de naciones asoleadas” (“Union of Sunlit Nations”). As Jaime put it, up in the U.S. we were the “provincianos,” and in sending a carfree event north, they were “universalizing” us. CicLAvia’s postcolonial significance has largely been overlooked in interpretations of the event, and its current organizers tie the concept to the “tactical urbanism” trend developed in New York City. I have found that some Los Angeles community activists see CicLAvia as an event that only made it to communities of color through strategic organizing after the first event. They critique it as yet another “livable streets” investment serving only affluent and white communities. When the route expanded to East LA, some in the community called it an unwelcome agent of gentrification. There is no doubt that CicLAvia can be a change agent. Opening the streets can open the city, bringing outsider attention to neighborhoods long viewed as dangerous and uninhabitable. And CicLAvia comes on a bicycle, currently the quintessential symbol of white, middle class-centered urbanism. I have written elsewhere about “bike-friendly” projects used as a gentrification strategy, including the praise CicLAvia has received from the downtown Los Angeles development community.6 Thus, in the absence of investments in affordable housing, new bike projects can be understood together with urban gardens and greening initiatives as drivers of environmental gentrification. Of course, CicLAvia is more than this. In a nation still struggling to grow beyond the racial and social segregation that has held us back for so long—and unlike sustainability efforts that are primarily eco-oriented—CicLAvia also sheds light on the diversity already present in LA It may be seen as a form of popular or vernacular sustainability, showing how traditional approaches to mobility used by poor people around the world are part of a broader mobility solution in the face of climate change. And in this sense, it forces an important question: how can we value and seek to sustain the neighborhood character of diverse, transnational communities at the same time that we sustain green space and reduce CO2 emissions? What does it mean to improve our streets when our economic order is structured to increase individual, not community, wealth? 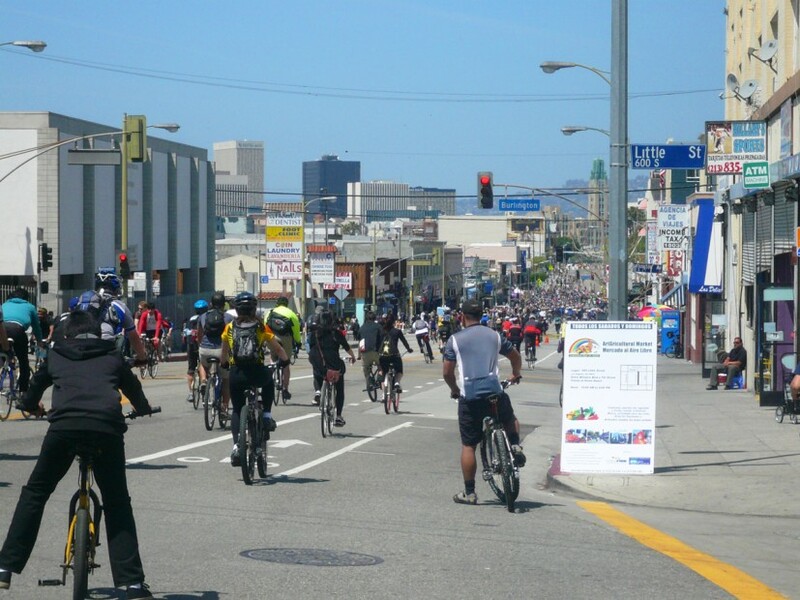 CicLAvia’s success lies in the fact that many people already traversed Los Angeles en bici. The bicycle itself is not novel, only its respectability. Bustling life in central LA is also nothing new, though we might homogenize it if we continue to recklessly value places separately from the people who make them interesting. In CicLAvia all this unfolds, because it is a site of experimental intersection between how we travel and where we live, eat, and play. These aspects of development and planning are regulated separately, often with contradictions in terms of who can afford to stay in our new, “sustainable” urban centers. But perhaps CicLAvia will shed light on the need for more holistic approaches, and the necessary relationships, for instance, between green and affordable housing and transit. We may yet join the Union of Sunlit Nations. Stubbornly, I am hopeful, though I know I can’t make all of LA see CicLAvia my way. 1. Arvind Singhal and Karen Greiner, “Performance Activism and Civic Engagement Through Symbolic and Playful Actions.” Journal of Development Communication, 19:2 (2008), 43–53. 2. 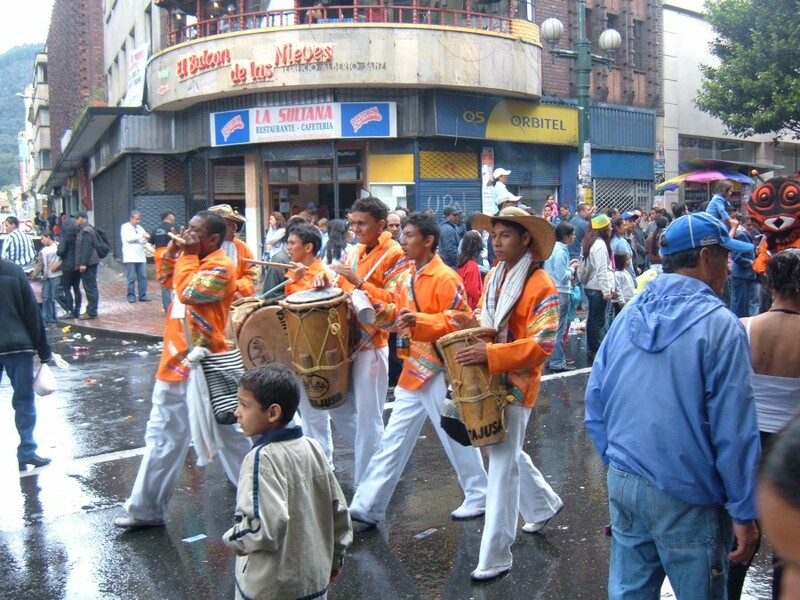 Sergio Montero, “Worlding Bogotá's Ciclovía: From Urban Experiment to International ’Best Practice.’” Latin American Perspectives (forthcoming). 3. For example, see the “Open Streets Initiatives: Measuring Success” toolkit sponsored by a major public health funder, the Robert Wood Johnson Foundation. 4. I chronicled the origins of the event in Adonia E. Lugo, “CicLAvia and Human Infrastructure in Los Angeles: Ethnographic Experiments in Equitable Bike Planning.” Journal of Transport Geography, 30:2 (2013), 202–207. 5. Adam Nagourney, “Los Angeles Lives by Car, but Learns to Embrace Bikes.” New York Times, May 20, 2012. 6. Melody Lynn Hoffmann and Adonia E. Lugo, “Who Is ’World Class’? Transportation Justice and Bicycle Policy.” Urbanities, 4:1 (2014) 45–61. 7. Johana Londoño, “Latino Design in an Age of Neoliberal Multiculturalism: Contemporary Changes in Latin/o American Urban Cultural Representation.” Identities: Global Studies in Culture and Power, 17:5 (2014), 487–509. 8. Robert Suro, Jill H. Wilson, and Audrey Singer, “Immigration and Poverty in America’s Suburbs.” Washington, D.C.: Brookings Institution, 2011.